Discussion in '240Z / 260Z / 280Z' started by AliK, Aug 2, 2018. Do we know of a good source for UK / Euro FSM? I have these but not sure if I should be using the 260z FSM or 280z as the US 260 is different in many ways to my '77 260. The nico club ones were shut down by Nissan lawyers for no apparently good reason other than they just could flex IPR muscles. Not sure they are helping with the heritage of their cars and the follower base in this instance. I have the nicoclub FSM saved on a usb but it's the 74 260 I was working from. At a guess I'd say a lot is the same but a 77 260 might be closer to a 280? Thanks chap, I agree. Just wondered if anyone had European FSMs for mine. Scanned and published in our club members forum section. The French "our club"? Or have you posted them somewhere on this forum? Thanks Sean, that's great. Does it mean I have to join French club to get them? French.yes. these are the manuels with exploded part numbers diagrams. Are you looking for a nissan 'haynes' ? Not really - I already have Haynes but find the Xenon.com FSMs to be far more detailed and was looking for the equivalent for a European late 260z. Yes. Buy one! 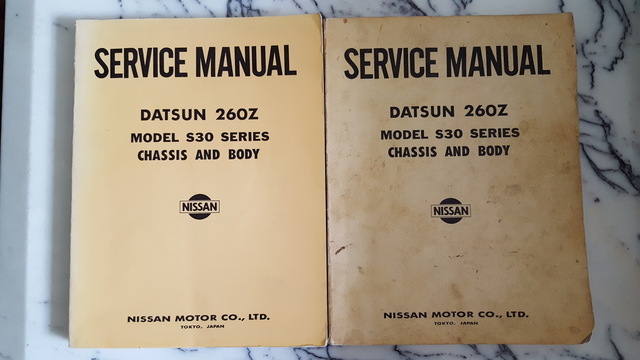 I've put genuine Nissan factory service manuals and parts lists up for sale before now and people either want them for nothing, or for peanuts. In my opinion they are worth EVERY PENNY. Nissan are actually fairly generous when it comes to this kind of thing. The key point is that people/clubs need to ask for permission to publish Nissan copyrighted material for fair use within a particular group. If you take the proverbial, they are well within their rights to shut you down. 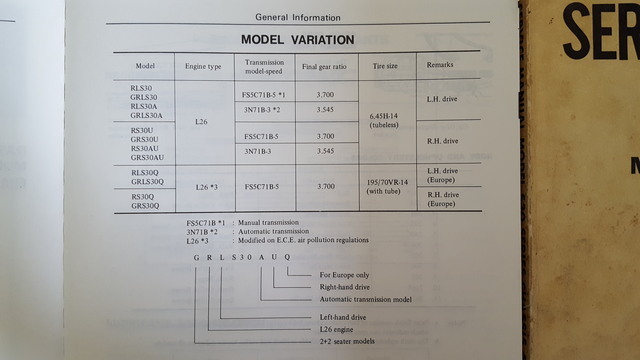 I have a couple of the UK/Europe factory service manuals which cover the UK market RLS30Q and GRLS30Q models - one printed in 1975 and one in 1977. I believe the 1977 version has a few updates that are pertinent to the later models, but they are ostensibly the same. Id buy them Alan. And thé way around nissan ali IS to make them available only in the members only sections of club forums...with thé added advantage of being more encouragement to join. What more do you need thanks Haynes and isnt tours à 240 or am i totally wrong? Than....not thanks. Bloody french spellchecker! Thank you Alan, I'd gladly pay if I could find them for sale. I'd be delighted to borrow them - thank you for the kind offer. I will PM you to arrange picking up as I wouldn't want to trouble you with postage / risk of loss! What more do you need than Haynes and isnt yours a 240 or am i totally wrong? Because they don't always have enough detail or any at all! So maybe the USA version IS more comprehensive?